It may be difficult to recognize, but one of the most used items in your kitchen is the one you probably put the least amount of thought into buying—your cutting board. Many of us think, “Big deal. It’s just a cutting board.” Yes, it is a simple cutting board, but further inspection reveals so much more. From meats to fruits and vegetables to cheeses and other assorted foods, the cutting board handles a lot of mealtime tasks. Not only does it manage those items, but the cutting board usually does so when food is raw or has received a cursory rinse. Further, when the cutting board is in use, it usually means we have a sharp object in one hand. 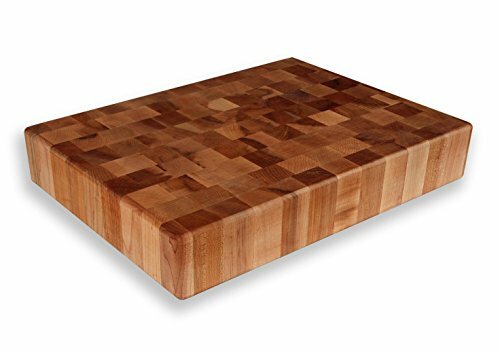 Not to be too overly dramatic, but if you want to avoid a lost finger and Salmonella poisoning, it’s probably worth it to have the best available cutting board. Before we get into our rankings of the best cutting boards, it's important to understand the key difference between the numerous options in stores and online. Cutting boards typically come in one of three different materials: wood, bamboo, or plastic. 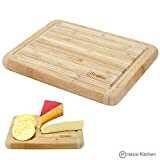 There are also cutting boards made of glass available on the market, but these are often highly impractical and do not come close to the performance of the other three materials. For this reason, we’ve left them off of our rankings and only suggest you use them as a decorative or serving piece. It's not too far-fetched to consider that the vast majority of kitchens in the United States have at least one wood cutting board. Hard and durable, but easy on your knives, wood offers a ton of variations from which to choose. The big drawback to wood is that it is very porous, which means it absorbs the moisture from almost anything you put on it. That’s not good if you cut up a lot of raw chicken or use your board to prep beef products. A lot of upkeep and cleaning is required to for the woodcutting board to stay in top condition but they will last a long time if cared for properly. 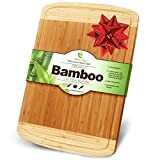 In recent years, bamboo has become a very popular option for cutting boards. Often mistaken for wood, bamboo is a grass that is harder and more lightweight than its wood counterpart. 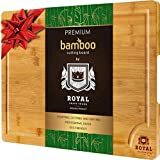 Perhaps the most stylish of the three material options, bamboo boards are also marketed as environmentally friendly (the source bamboo matures considerably faster than a tree would). Similar to wood, bamboo is porous which can allow bacteria to collect in the surface. A bamboo board will need to be regularly maintained with oil to avoid splintering and to keep it in the best possible shape. Best For: Fruits and vegetables; meats if use for a board is exclusive. Thanks to their durability, variety of options, and ease of cleanup, plastic cutting boards are widely used in kitchens across the country. Made of polyethylene or polypropylene, plastic cutting boards can stand up to a lot of heavy use. They can also dole out some abuse of their own. Aside from being harder on your knives than either wood or bamboo, plastic boards are more likely to see deep gouges open up from the constant cutting. A couple of studies, one from the University of Michigan, the other from the University of Wisconsin have shown that these gouges can harbor a lot more bacteria than their wood or bamboo counterparts. Proper cleaning can help mitigate these concerns, and with plastic boards, they are dishwasher safe, which will further contribute to disinfecting the cutting area. Also in the plastic family, are cutting mats, which tend to be less rigid than a regular plastic board. The cutting mats, often made with silicone, usually come in color-coded sets that allow you to designate a mat for certain food types. Our primary goal is providing you with as much accurate and detailed information as possible so you can make an educated, well-informed decision when purchasing a new cutting board. To ensure this, we have researched every product on this list and looked at plenty more that did not make the cut to determine the best of the best. Ratings, specific consumer feedback, product performance, brand research, and value and pricing have all gone into defining who made this list and who did not. We hope the information here helps guide you in the purchasing process and selecting the cutting board that best suits your needs. With so many cutting boards options available, we wanted to ensure you had a variety to look at and consider before making your purchase. To that end, we broke down the top three products in each material type and noted a best overall option that rose above the other products we reviewed. With that in mind, let’s take a closer look at the best cutting boards currently available. Cutting boards may all seem the same until you use one that truly stands apart and turns the sometimes tedious job of slicing and dicing into the highlight of making a meal. 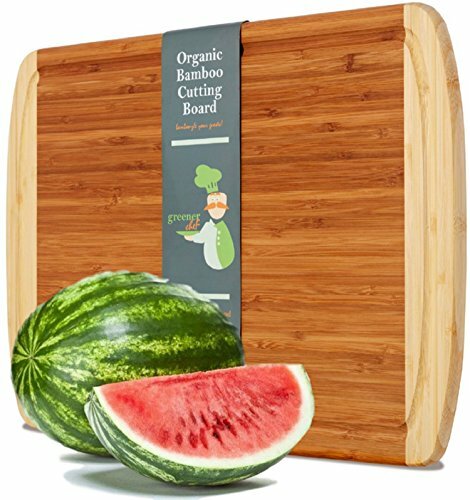 The Greener Chef XL Organic Bamboo is that cutting board. Stylish, practical, and above all comfortable to use, this board takes our top spot due to its overall quality and its lifetime replacement warranty. That’s pretty impressive for a product that, by its nature, is meant to degrade over time. The Greener Chef is also easy on your knives and your health with an FDA approval to prove it. The 18” by 12.5” size also gives you ample room to work your culinary magic without overpowering your counter space. If you only had one board to buy, this is our top recommendation. Made in the United States, this wood board may be the best looking cutting surface on our list. The thick, 17” by 11” surface is an excellent size for multiple types of food prep, and the dark walnut hue will dress up even the drabbest kitchens. Care is key with the Virginia Boys walnut board, so the better you maintain it, the longer its looks and function will last. 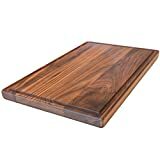 Yes, a composite wood cutting board made our top three wood boards. It is hard to argue when the Epicurean shows high marks for sturdiness, versatility, and ease of use. These kitchen helpers are also dishwasher safe. These boards come in a 3-piece set and show a heat resistance up to 350 degrees F, which means you can use them as a trivet or service plate for hot foods. This thing is a beast. Seriously. It’s a straight-up block of awesome. The three and a half inch thick board has a substantial cutting surface that is 20” by 15”. It’s also another US-made product that will require some upkeep to maintain its prime condition. Incredibly sturdy, you won’t worry about it being too delicate for prepping needs. One drawback here is that it is a flat, smooth surface on all sides. Cutting up anything too juicy can lead to some messes, but the board itself is easy to clean and season. Our top bamboo board is a workhorse in the kitchen, lending itself to multiple uses along with the regular cutting and carving. Unlike a lot of other boards that only have one workable side, this one is reversible. The Pratico has an ample cutting surface but also some of the deepest juice grooves of any board on this list, which makes it a great pick for messier prep work. You also get a lifetime warranty with this choice, so there’s a great value here too. 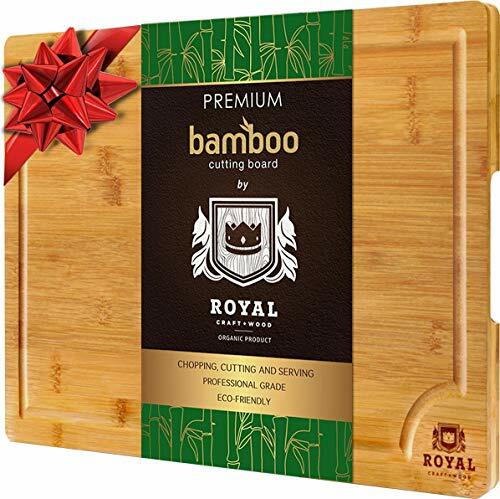 If you need a cutting board to pull double duty as a service tray, it's tough to top Royal Craft’s bamboo offering. The large 18” by 12” board has notched handles on both sides to make transporting from the kitchen to your table or buffet very easy. Additionally, it offers the knife friendly qualities of bamboo but will require regular care and maintenance to avoid any long-term damage. 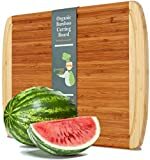 Not every cutting board needs to be a hulking mass or take up a sizable chunk of your counter, which is why we included the Midori small bamboo board on this list. A svelte 12” by 9” cutting surface, this is a wonderful option for small kitchens. 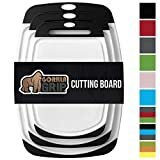 Less than an inch thick, it's not recommended for heavy duty use either, but will serve those who don’t need an everyday board for food prep very well. 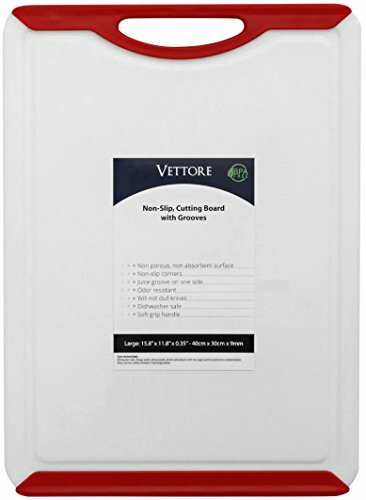 This Vettore non-slip was a close second as our overall best board, and it would be difficult to find a better plastic, dishwasher safe product than this. The 15.8” by 11.8” board will carry the load for almost any food prep. The textured surface prevents food from slipping, and the non-slip edges keep the board from doing the same. You can also bundle together the large board with a smaller 11” by 8” board. If you’re an everyday chef, then you need cutting boards to fit that title. 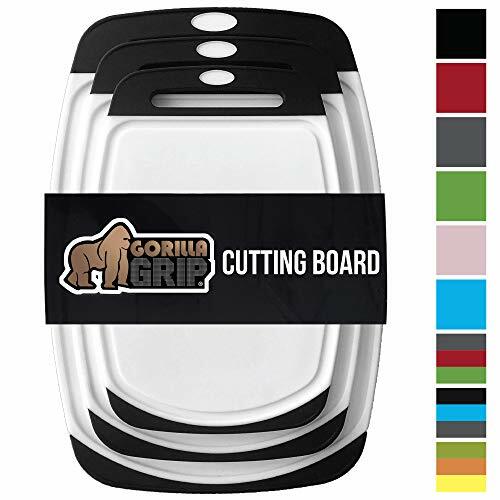 The Gorilla Grip set of three boards will serve you well, and then some. Thick heavy-duty construction help make the boards durable while the non-stick border keeps it in place even with more significant cuts of meat. The three pack also means you’ll get versatility to match your cooking needs with different size options of 11.8” by 8”, 13.8” by 9.6”, and 16” by 11.2”. If you’re looking more for cutting mats instead of a full board, then the Resort Chef mat set is your best option. Each color-coded set allows you to designate a specific mat for a meat or vegetable, which helps ensure healthier food prep. There are two size options of medium and large and the mats are also dishwasher safe and very easy to store. As a bonus, the Resort Chef also throws in a 3” ceramic paring knife with each purchase. Finally, we wanted to throw in a little bonus to highlight just how involved and inventive you can get when considering your next cutting board. 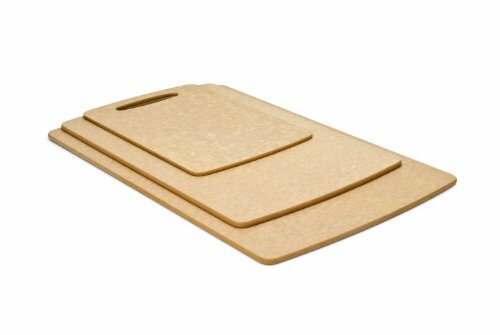 Therefore, our best hybrid option, which combines a bamboo cutting board and plastic mats, is the Seville Clean Bamboo board. A storage sleeve under the traditional bamboo surface conceals five or seven color and symbol coded plastic mats. The top of the board is grooved so that the cutting mats fit snug and can be used to cut on or serve from. 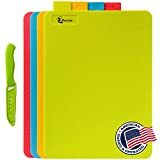 The Seville provides an elegant solution to getting the look and feel of a bamboo cutting board with the ability to prep your food on a colorful and easy to clean plastic surface. When it comes to cutting boards, there is no lack of options. From the insanely large counter top butcher blocks to the rather small cheese slicing mats, there is plenty of variety. Choosing the right one for you is a difficult task. This best way to narrow down what you want or need is to figure out what type of cook you are, or want to be. Let how you prep and cook food be your guide in determining the right board for you. Are you mainly a veggie person who only needs something that will improve your salad and side dish prep? Or perhaps you’re more carnivore and need a cutting board designed for chicken and beef and fish. Maybe, like most amateur chefs, you're somewhere in between. Regardless of your style, once you determine your cooking needs, the breakdown of the different cutting board options is more straightforward. And the choice for you becomes a bit easier to make.